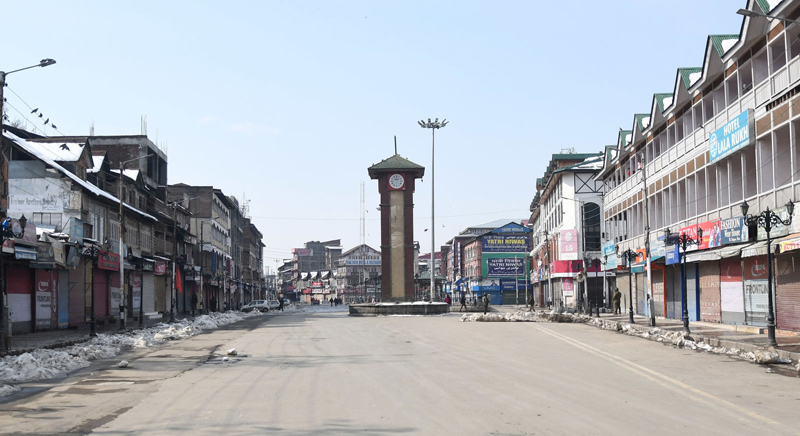 A complete shutdown was observed in India-held Kashmir against the banning of Jammu and Kashmir Liberation Front (JKLF) by the Indian government, the Kashmir Media Service reported on Sunday. New Delhi had announced a ban on the pro-independence group on Saturday as part of a crackdown on what it calls ‘separatist organisations’. A statement issued in New Delhi had said the Indian government declared JKLF an ‘unlawful association’ as it was trying to curb the activities of ‘secessionist organisations’ posing a threat to the country’s unity and integrity. The group’s leader, Yasin Malik, was arrested recently in a counteroffensive against dissent following a Feb 14 suicide attack that killed over 40 Indian soldiers in the disputed region. Over a thousand people have been arrested since then. The call for a strike was given by the Joint Resistance Leadership (JRL) comprising Syed Ali Gilani, Mirwaiz Umar Farooq and Yasin Malik. All shops and other business establishments were shut in Srinagar and other cities of the valley. Indian police and paramilitary forces set up checkpoints at several places, while troops were deployed to foil possible protests in downtown Srinagar. “The order to ban Jamaat-i-Islami and JKLF is nothing but an act of political vengeance and an oppressive tactic to suppress the just movement of people of Jammu and Kashmir. The Indian government’s decision to ban the organisations peacefully striving for the resolution of Kashmir dispute will not cow down the people,” a statement from the JRL said. The statement added that the Indian government wants to push people towards the wall for raising the demand to get their rights but it will not make pro-freedom leadership to crumble. Many groups have been fighting for the Himalayan region’s independence from India or its merger with Pakistan since 1989. A 30-year fighting in the region has left tens of thousands of people dead, mostly civilians.